Are you planning to buy a designer wedding dress made in China? If you look at the labels in wedding gowns most aren't most of them made in China? You are right... most designer label wedding dresses are manufactured in China. But these are not the same gowns you are ordering direct from China that are priced so cheap. Top bridal designers DO have their gowns made in China. But they have agreements outlining the particulars of how their dresses are to be constructed and sized. Part of that contract is that designer gowns cannot be sold to the direct public. So the wedding gowns you are seeing sold on numerous wedding dress websites are NOT DESIGNER GOWNS. 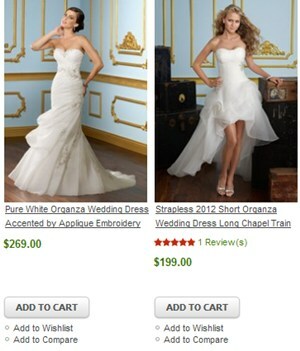 You are getting copycat knock off wedding dresses. Are These The Same Gowns I See In The Bridal Shop? Please realize you will be getting a copy of the designer dress. Not the same designer dress you saw at the bridal shop. If you really want the designer dress you have to buy it from an authorized dealer usually located in your country. If you don't really mind that the dress will not be exactly a designer gown then a wedding dress made in China may be for you. Just realize that the gown quality and construction techniques do not rise to that of REAL designer wedding dresses. As you know there are no shortage of these websites on the web so... how do you choose? VERY CAREFULLY! Some of the sites are SCAMS and what they send you is only fit to throw away. So you definitely have to do your homework. "I have not seen a gown that matches the construction techniques and fabrics top designers use. The engineering, yes... engineering that goes into creating a wedding dress that is able to shape you to it... is truly amazing. This is only true of top designer wedding gowns not copycat gown designs." The price of these wedding dresses from China are really hard to resist. 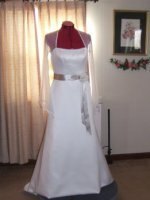 These dresses CAN be a good value when you find a wedding gown manufacturer who does put out a good quality garment. They use less fabric in the knock off gowns. They use cheaper fabrics and accessories. Cut back on construction details. Problem one... this is very noticeable when you order a big ballgown wedding dress. It doesn't come in as full as pictured. Many brides think adding a slip will help make a dress get bigger. But it only fills the skirt out but not make the skirt bigger. A slip can't make up for fabric that is not there to begin with. Just be mindful of this if you want a really full ballgown dress. Also most designer gowns come with built in slips but very rarely will you find a built in slip in a replica wedding dresses. Some don't even put in boning and bra cups, which are needed to help give the dress shape. Cutting these corners keep prices down, but it also causes fitting challenges for you and the sewing professional that will work on your gown. Some of these issues CAN NOT be corrected. The only way you can get authentic designer's gowns at a reduced cost is to order from an online source domestically here in the U. S or in the country you live in. These sources are authorized to sell the designer's gowns and they discount generally between 15% to 30%. Some local bridal shops will discount your gown some if you ask. Over the years as a bridal alterations specialist I have seen wedding dresses from China improve quite a bit. I have seen some pretty decent wedding gowns come through and I have seen some disasters. ...then this could be the best choice for you. Especially if you tend to be very practical thinking remembering the bridal gown is just being used for one day. But if you can't afford to throw away $300 on a dress that may or may not work out, then it is best to get a gown another way. ...then a knock off wedding dress made in China is NOT for you. I have not seen a gown that matches the construction techniques and fabrics top designers use. The engineering, yes... engineering that goes into creating a wedding dress that is able to shape you to it... is truly amazing. This is only true of top designer wedding gowns not copycat gown designs. Replica bridal gowns CAN look good but a lot depends on how close you are to having a perfect shape and using a lot of foundation garments. Still from my experience these gowns do not approach the same overall look and do for your body top designer gowns do. This is why for those who notice things like this will NOT be happy with a knock off design. You need to find your alterations specialist first. Bridal shops in most cases will not alter these gowns for you. And some alterations specialist may decline to alter these gowns. Expect to pay more for your alterations cost because usually there are more fitting and construction problems with these gowns. Find a dry cleaner. Some dry cleaners are declining to press, steam or clean these gowns because they usually don't have the required care tags in them. They don't want the liability of the gown fabrics and trims not holding up because of the inferior quality and workmanship. Make sure you will be able to get someone to work on the gown before you buy one. Here is a must read article by a wedding blogger warning brides not to buy replica wedding dresses. Take a look at the pictures of the original dress and the copies received. You will see a vast difference in the style and the quality just from the pictures. Pictures are worth a thousand words! You might also want to take a look at the video entitled "Beware of Counterfeit Wedding Dresses." This is a news clip about the problem of ordering gowns online from unauthorized sources that make you think they are selling authentic designer wedding dresses. My experience is that it is that the quality of work is inconsistent from one online bridal store to another online bridal store. This is true even from within the same source. One bride can get a gown that is acceptable but then from the same source the next gown that is bought the quality isn't the same. I have personally seen this happen. Some of the China based manufacturers outsource their orders to independent contractors but sell their goods under one brand name. That seems to be the reason for the inconsistent quality within the same brand from style to style. As I have said before you have to be careful when ordering Chinese wedding dresses on eBay or from wedding dress wholesalers, etc. from China. Remember... have a back up plan in place just in case things don't work out with your order.